Imposing performances, comprehensive wins were the order of proceedings as play commenced in the opening round of the Uncle Pop 2018 ITTF Women's World Cup in Chendgu on the morning of Saturday 29th September. 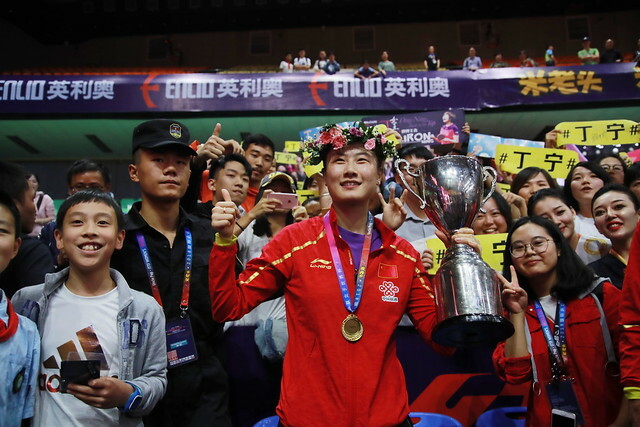 China’s Zhu Yuling and Ding Ning emerged successful in style, as did Austria’s Sofia Polcanova and Chinese Taipei’s Cheng I-Ching. Zhu Yuling, the top seed, proved too consistent for Sweden’s Matilda Ekholm, the no.14 seed (11-8, 11-6, 11-5, 11-5). Similarly in a contest that proved rather more convincing than was envisaged, Austria’s Sofia Polcanova, the no.8 seed, accounted for Romania’s Elizabeta Samara, the no.10 seed (11-9, 11-8, 11-9, 11-6). Just as Zhu Yuling was able to keep the ball on the table one stroke more than her Swedish adversary, so was Sofia Polcanova. Early in the rallies she focused her attacking strokes towards the backhand of the Romanian, nullifying the lethal Elizabeta Samara forehand. Equally, she was the quicker to execute the first attacking stroke, throughout pressurising her adversary into making errors. The first three games secured, in the fourth, Sofia Polcanova went ahead 3-1, Elizabeta Samara called “Time Out”; the break worked in favour of the Austrian, she won the next two points before her adversary responded. At 10-3, Sofia Polcanova held seven match points; the previous day, Elizabeta Samara had saved four, two against Egypt’s Dina Meshref, two in opposition to Chinese Taipei’s Chen Szu-Yu. On this occasion she saved three, no more; Sofia Polcanova prevailed. Immediately following, Ding Ning, the no.3 seed, emulated the efforts of Zhu Yuling to beat Liu Jia, the no.16 seed and like Sofia Polcanova from Austria (11-7, 11-9, 11-4, 11-7), before Cheng I-Ching, the no.4 seed, overcame Hungary’s Georgina Pota, the no.15 seed, a contest in which the third game proved pivotal. Trailing by two games to nil, and down 3-1 in the third, Georgina Pota called “Time Out”, she levelled at 9-all before holding game point at 10-9 and then on two more occasions. Eventually on her eighth game point Cheng I-Ching succeeded. A close third game, likewise the fourth was decided by the minimal two point margin and again in favour of Cheng I-Ching after Georgina Pota had held one game point at 10-9. Cheng I-Ching converted at the second attempt to secure a last eight place (11-6, 11-8, 20-18, 13-11). Just as in the preceding contests, the extra level of consistency had won the day.